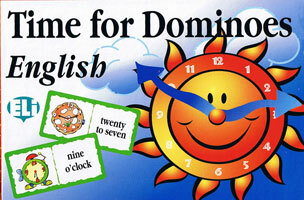 Learn to tell the time in English with this boxed set of 48 beautifully illustrated "time dominos" cards. The supplied teacher's / parent's guide describes several fun and motivating variations on the domino game. This game is equally suitable for children learning English as a second language, or for young native English speakers learning to tell the time. Very good. Pity that the other product I wanted was out of sale.